I like to think of fried food as sort of a savory treat. I don’t order fried food at restaurants most of the time, I just don’t know what they’re actually frying up and I usually have to get through some type of greasy bread coating to figure it out. One thing is for sure I have never been disappointed when frying at home. I also love the feeling of accomplishment when I realize I didn’t set the house on fire in the process. Besides that, I can honestly say I enjoy the fried food that comes out of my kitchen. I know that the food produced in my kitchen is worth the calories I am about to ingest, and I know the love that went into it, plus I know that it was real food that sizzled in my pan while it was frying up. I kind of like to think of these tacos as fancy fish tacos. 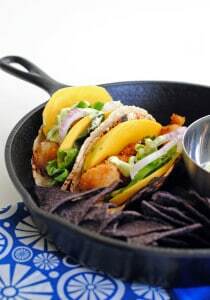 With so many variations of fish tacos that typically are made with white fish, it’s nice to come across a recipe using something different, and in my opinion, better! The original recipe comes from the magazine Cuisine at Home Issue No. 86 April 2011. I made a few small changes to my version below. Puree sour cream, cilantro, oil garlic and avocado in a bowl of a food processor until smooth. Season crema with lime juice, jalapeno, salt, and pepper and chill until ready to serve. Combine cornstarch, 3/4 teaspoon salt, 3/4 teaspoon black pepper in a shallow dish; set aside. Whisk eggs, 1/4 teaspoon salt, and 1/4 teaspoon pepper together in a shallow dish and set aside. Pour panko into a third shallow dish and set aside. Heat oil in a large saute pan over medium heat to 360 degrees. Dredge each scallop in cornstarch mixture, lightly coating sides. Dip into egg mixture, then into panko. Fry scallops in oil until browned on all sides, 3 minutes total. Remove scallops to a paper-towel-lined plate. Season with salt and set aside. Heat a gas burner over medium-low heat and char the tortillas on each side or coat a nonstick skillet with nonstick spray and fry each tortilla over medium heat, 30 seconds per side. 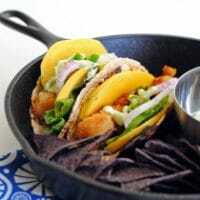 Fill tortillas with cabbage, mango and onion. 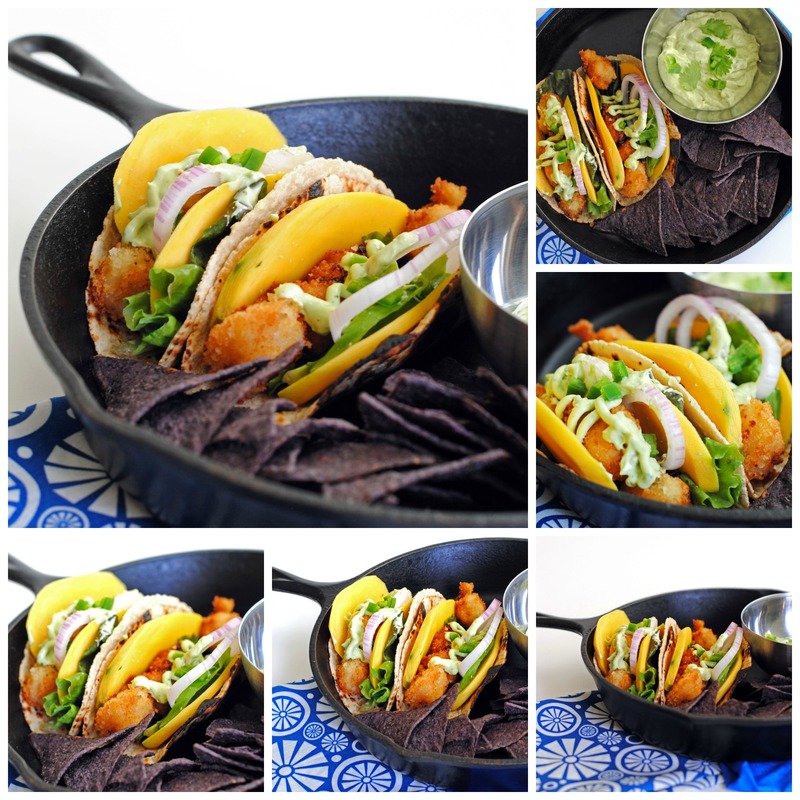 Divide scallops among tacos, then top each taco with crema.